Good evening to my readers, we are going to be continuing with the medium size dog breeds that are recognized by the American Kennel Club, this is not taking into consideration all the “designer breeds” they are starting today so please keep your eyes open for special articles when I locate one of those as well. The Field Spaniel originated in England and is a breed of the spaniel type, born of the Cocker, English, Springer, and Sussex crosses developed to be show dogs in the late 19th and early 20th centuries. Seeing in this (small in number) breed the close resemblance to their ancestors they only stand 17 to 18 inches at the withers, weigh 35 to 44 pounds, and have a life expectancy of 10 to 12 years. You can find this non-working hunting dog in a variety of colors that include black, liver, black & tan, liver & tan, blue roan, and liver roan. 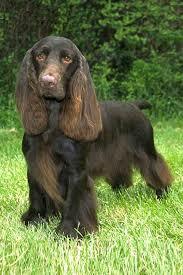 Their long, feathery ears and long-haired coat requires daily brushing to keep your Field Spaniel looking his/her best. Being sweet and sensitive a Field Spaniel makes a wonderful family pet with children docile indoors while vigorous and game for anything when out playing. Gentle training advised with these sensitive souls who are cautious, sociable, adaptable, playful, intelligent, familial, trustworthy, and tolerant. This breed is a house dog and one to be proud of with the temperament and friendliness required for guests of all ages. 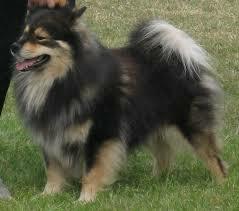 The Finnish Lapphund originating in Finland a medium-size breed of the Spitz type used for herding reindeer. Being one of the most popular breeds of Finland it is not well-known outside of the Nordic countries unless you herd reindeer. Finnish Lapphunds are a weatherproof breed with a double coat that keeps them warm in the cold and cool in the heat, with the curled tail full and fluffy over the back the luscious coat colors can be found in white, black, wolf-sable, sable, brown, and red. The breed looks larger than what they are with the double coat which requires brushing to keep it from getting matted they stand 15 to 20 inches at the shoulders, weigh 33 to 53 pounds, and have a life expectancy of 12 to 14 years. This empathetic breed is among the friendliest of all the dog breeds although they will be a bit wary of strangers. With their craving for constant companionship they make a great family pet with children and will be miserable if neglected. A bad breed trait is a strong “startle reflex” so small children need to be supervised with them as usual, but the temperaments of being keen, friendly, faithful, calm, courageous, quick, and agile still make them good pets. Shedding and barking can be a nuisance but they are still popular pets in their homeland and growing out into other areas today. The Finnish Spitz breed originated also in Finland and was bred to hunt all types of game from squirrels to rodents, to bears this breed is a “bark pointer” indicating the position of the game drawing its attention so the hunter can approach unnoticed. This lively flame-colored, foxy-faced breed that comes from the “Land of 60,000 Lakes” comes in red, red gold, and gold stands 15 to 20 inches at the shoulder, weights 15 to 29 pounds, and has a life expectancy of 12 to 14 years. Although they have the look of a fox the distinct curving plumed tail and vocal fearless style of tracking and indicating quarry earned them the nickname of the “Barking Bird Dog”. 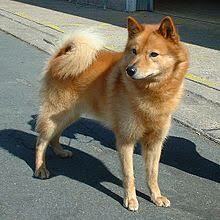 Finnish Spitz makes an excellent alert dog but though they are wary of strangers they are not shy. Eager canine athletes, they are loyal, independent, intelligent, playful, happy, sensitive, and captivating companions making a good family pet with children of almost all ages. In Finland, the owners of this breed will hold a contest to crown a “King Barker” to see whose dog can yodel and have the longest range of vocalization. The Flat-Coated Retriever is a gun dog breed originated in the United Kingdom, developed as a retriever both on the land and in the water. Flat-Coat Retriever owners say this breed matures slowly retaining the puppy rambunctious mischief into their old age. As they say, this is either delightful or exasperating, depending on your tolerance for such monkeyshines. Standing 22 to 25 inches at the shoulders, weighing 55 to 79 pounds, and having a life expectancy of 8 to 14 years this highly energetic breed requires plenty of outdoor exercise. 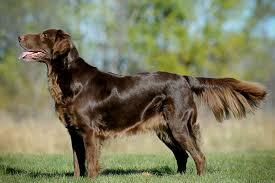 The flat-lying coat comes in black, liver, and yellow and they are a sporting group breed. This forever young breed is a great family dog with older children always happy, self-assured and willing to please, but being one the happiest breeds not good with small children its tail is always wagging and could knock them over. They are great for the outdoors type family always optimistic, outgoing, devoted, confident, and friendly ready to go for a walk, hike, bike ride, or a swim take them along for the fun they will be up for it. The French Spaniel is a decedent from dogs of the 14th century and was developed in France and Canada, a breed of dog of the Spaniel-like setter used as a pointer and retriever for hunting. The French Spaniel in its native country is the Epagneul Français (French). A medium-sized dog standing 21 to 24 inches at the shoulder, weighing 45 to 60 pounds, and having a life expectancy of 12 to 14 years. 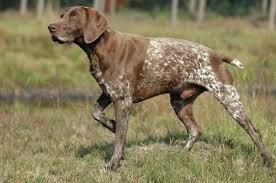 The medium length coat is wavy and is feathered one the tail in colors of roan, brown & white, brown, and spotted white. A great companion breed to his master his enthusiasm, energy, toughness, and willingness to work hard are part of his heritage. A French Spaniel will make a stable family dog that is good with children and other household pets, they are energetic, intelligent, adaptable, loving, tough, calm, balanced, frank, gentle, sociable, and docile. Because of these temperaments, they are also friendly with strangers so you are not getting a watchdog with this breed but a loving companion. 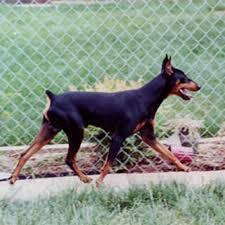 The German Pinscher originated in Germany a medium-size breed of the Pinscher type that is included in the origins of the Dobermann, Rottweiler, Miniature Pinscher, Affenpinscher, and the Standard Schnauzer. Among Germany’s oldest breeds they stand 17 to 20 inches at the shoulder, weigh 24 to 44 pounds, and have a life expectancy of 12 to 14 years, the short coat comes in black, fawn, blue, brown, and red. Being first used in Germany as a rat-catcher this breed can be trained for all types of canine work. The affectionate German Pinscher is good with children, but suspicious of strangers being a guard dog of its family even it not being trained to do so. This breed is lively, intelligent, playful, spirited, even-tempered, loving, tenacious, courageous, and familial. This breed is one of the best companions one could ask for always confident and ready for anything. The German Shorthaired Pointer originated in Germany in the 19th century as a gun hunting dog and is known by owners as the “Perfect Pointer”. This gun dog breed thrives one vigorous exercise like running, swimming, organized dog sports, in fact, anything that will burn some of their boundless energy while spending outdoor time with their humans. Standing 21 to 25 inches at the shoulders, weighing 45 to 70 pounds, and having a life expectancy of 12 to 14 years this aristocratic companion requires love and positive training techniques. 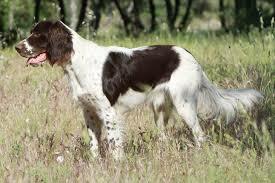 The short smooth coat comes in liver roan, liver & white, black & white, liver, and brown all in distinctive patterns. Being a bold, affectionate, boisterous, intelligent, cooperative, trainable, enthusiastic, agile, and friendly breed makes a happy trainable pet who will bond with their family. Apartment living is not advisable for this breed they need to have room to run and be outdoors to expel the massive amount of energy they possess. Spending time with humans doing any outdoor activity will make them happy. 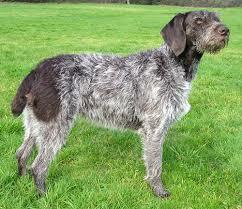 The German Wirehaired Pointer originated in Germany a griffon type breed of the 19th century and became a leading gun dog in the later part of the 20th century. With a weatherproof coat, the German Wirehaired Pointer is protected against thorny underbrush and foul weather hunting all day without tiring. The coat colors are liver, roan, black & white, and liver & white, this breed stands 22 to 27 inches at the shoulders, weighs 60 to 71 pounds, and has a life expectancy of 12 to 14 years. The unmistakable shaggy beard and eyebrows complete their intelligent worldly expression. Looking for a companion that is good with older children that is an eager, affectionate, and amusing family companion? German Wirehaired Pointers are willful, affectionate, loyal, intelligent, friendly, active, independent, and inquisitive but a great fit for those who love the outdoors and are willing to spend time with them doing anything outside. This is not a breed for elderly people who are looking for a couch potato for apartment dwelling. The Grand Basset Griffon Vendéen originated in France and is a breed of the scent hound type bred to hunt rabbit and hare but can be trained for hunting other game as well. 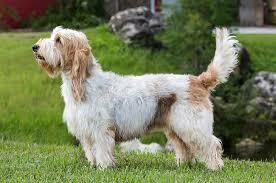 Translation of this breeds name is “Large, low, shaggy dog of the Vendée” (large (grand), low to the ground (basset), having a wiry coat (griffon), and originating in Vendéen (a region in France), and pronounced “Grand-Bah-SAY Gree-FOHN VON-day-uhn.” Standing 15 to 18 inches at the shoulders, weighing 40 to 44 pounds, and having a life expectancy of 12 to 14 years, this shaggy-coated breed can be found in black & tan, orange & white, black & white, lemon & white, fawn & black, and tricolors. As a hunter this breed has the courage and stamina along with the vocalization required but mostly they are becoming family and companion pets today. Independent and energetic, the Grand Basset Griffon Vendéen breed is stubborn, alert, vocal, well-mannered, courageous, fast, somewhat active but not high-strung, they are busy dogs who do not tire easily. A fun dog to be around very willing to please they love children, other dogs, and even strangers so this is not a watchdog by any means, not a breed for around other small animal pets inside the home. They are adaptable and can be good with the elderly for apartment living as long as you can handle the stubborn personality trait with a firm hand knowing they are not naturally obedient and tend to be proud of their own decisions. I covered some really great breeds today with gun dogs to companion breeds, I find them all to be of extraordinary looks and having many different traits and temperaments. Those of you looking for companion breeds that will make great hunters that are always by your side where ever you travel have some hard decisions choosing from this list. Have you found the right doggie for you yet? Considering any of the breeds above? Interested in answers to those questions along with any comments, suggestions, or questions you have for me you can leave them in the space provided below.